The Moscow City Court has ruled that opposition activist Aleksey Navalny should remain under house arrest until his suspended sentence for major embezzlement comes into force. By the Tuesday decision the judge turned down the request from Navalny’s lawyers who wanted to cancel the prolongation of the house arrest till February 15. However, the court also did not fulfill the appeal of prosecutors who wanted the activist put in a detention center for violation of house arrest rules. 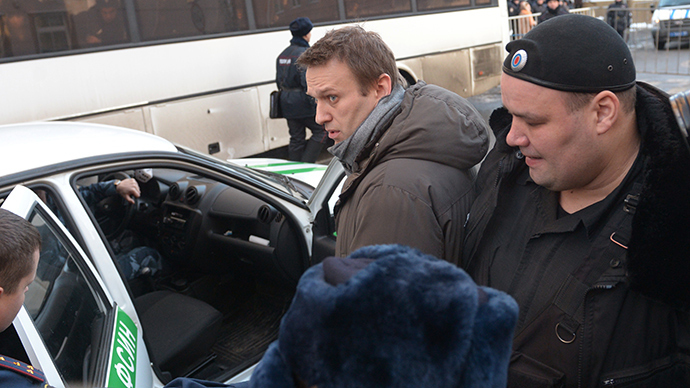 Navalny has left his apartment and removed the electronic monitoring tag from his body after his sentence was pronounced in late December and did this again in early January. Every time the activist was detained by police shortly after escape and returned under house arrest. Previous violations included maintaining the blog, microblog and accounts on social networks – activities that are banned for suspects whose freedom is limited. On December 30 Navalny received a suspended 3.5 year sentence after the court found him guilty of embezzling over $500,000 from cosmetics company Yves Rocher. Navalny’s brother Oleg was sentenced to 3.5 years in prison within the same case. In his court speech and numerous blog posts Navalny insisted on his innocence claiming that the criminal case and sentences were the revenge of Russian authorities for his uncompromising struggle against corruption. The officials have repeatedly dismissed these claims saying that opposition activities do not automatically make people immune from prosecution. In mid-2013 Alexey Navalny received another five-year probation sentence for taking part in a graft scheme involving a state-owned timber company in central Russia’s Kirov Region. Also on Tuesday Navalny called upon his supporters to launch a 100,000 – strong rally in Moscow as a protest against the authorities’ anti-crisis measures. The event will be organized by Navalny’s Party of Progress and the pro-business party RPR-PARNAS. The exact date of the march has not been decided yet and the press service of the Moscow City Hall said no official applications for it have been submitted.